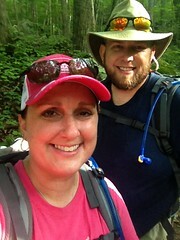 In preparation for our Mt LeConte hike on August 25th, we hiked to Virgin Falls on Saturday. Here is the Google maps link. It’s about 20 minutes from our house! 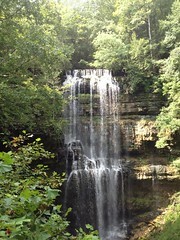 This a pretty fun hike with two falls and a lot of interesting trail. It’s downhill mostly from the trailhead to Big Laurel falls (about 1/2 way) then it’s up hill on the way back of course. RunKeeper clocked it at 7.9 miles with 1512″ of elevation gain. I’m not sure when the last rain was in the area but the first part of the trail was pretty wet and muddy. Jen slipped and banged her elbow pretty good on a rock. It was the first time I used my first aid kit for something other than ibuprofen! There was only one serious blow down on the trail and it wasn’t too hard to navigate although Tyler managed to scrape his legs up show boating on it. This was the second time I got to use my first aid kit for something than ibuprofen! Overall, we set a pretty leisurely pace and spent a lot of time hanging around at both falls so we didn’t make great time but we had a great time. This is a fun, interesting hike real close to our house. I’d rate this hike on the lower end of moderate on the difficulty scale. LeConte is next week and I’m pretty stoked!